Ambitious, innovative and detail-oriented, Vinny Pezzimenti has built a diverse professional resume and portfolio. With expertise in communications and journalism, Pezzimenti also possesses professional experience in marketing, design and website development. 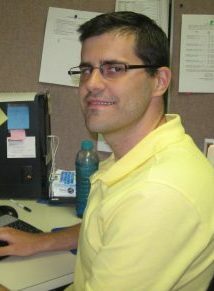 During the day, Vinny is the Public Information Specialist for Salamanca City School District. After hours he moonlights as a blogger, writer, web builder, social media guru, and trusted lead generator. At Salamanca, Vinny writes, edits, manages web pages, and posts to social media. He produces the school district’s monthly newsletter and other community communications materials, using his writing, editing, design, photography, and videography skills to pull it all together. Before making Salamanca his home, Vinny was Web Content Manager for Jamestown Community College. In that role, he provided leadership throughout the college to ensure the school website and social media platforms promoted student recruitment and retention, while also supporting communication throughout the campus and its external community. He worked closely with employees from various college departments to create, manage and develop website content, including, text, photos, and videos. Before coming to JCC, Pezzimenti was Agency Relations Coordinator for HomeCare & Hospice. There, he oversaw the public relations and marketing activities for the western New York-based organization. He served as the organization’s webmaster and helped guide the concluding stages of a complete redesign of the HomeCare & Hospice website in November 2013. Pezzimenti also independently created the agency’s first monthly email newsletter, redesigned bi-annual print newsletters, reorganized and enhanced social media channels, and helped increase online fundraising. Prior to his appointment at HomeCare & Hospice, Pezzimenti was a communications assistant at St. Bonaventure University. In that role, Pezzimenti was responsible for promoting and marketing the university’s athletic department, as well as its intercollegiate Division I teams and student-athletes. His duties extended to the development and maintenance of athletic department web pages, the production of printed athletic department publications, press releases and video highlights, and promotion of the athletic department via the web and social media platforms. At St. Bonaventure, Pezzimenti also gained experience in event and facilities management, alumni and public relations, and fundraising and corporate sponsorships. Among notable accomplishments, Pezzimenti produced and designed the athletic department’s first Basketball Fan Guide, developed a user-friendly Visitors Guide and oversaw the content and advertisement production of a 20-page men’s basketball program distributed at St. Bonaventure’s annual game in Rochester, N.Y.
Pezzimenti joined the St. Bonaventure Athletic Department in July 2012 while working toward a Master’s degree in Education (Athletic Administration focused) from the State University of New York at Brockport. While at Brockport, Pezzimenti engaged in a wide range of projects and presentations. He planned and directed a fundraiser to help the St. Christopher’s church youth softball team purchase uniforms, conducted an extensive 90-minute on-campus presentation — accompanied by a 75-page report — of Nazareth College’s athletic facilities, evaluated college sports information budgets for a term paper and presentation, and researched and analyzed the impact of intercollegiate athletic success and expenditures on the academic environments at institutions of higher education for a synthesis project and presentation. Prior to his schooling at Brockport, Pezzimenti spent nearly seven years as a news and sports writer, editor and designer at three newspapers in New York and Pennsylvania. He worked as a general assignment/news reporter at the Kane (Pa.) Republican before moving to the Olean (N.Y.) Times Herald and later the Centre Daily Times in State College, Pa. Pezzimenti spent four years in Olean as a sports reporter and editor and held similar responsibilities for 2 1/2 years at the Centre Daily Times. While in State College, Pezzimenti reported on Penn State football and high school sports. For his efforts, he was a four-time Pennsylvania Associated Press Managing Editors Award winner and also earned a second-place honor from the Pennsylvania Keystone Press for sports event coverage in 2009. During his time covering Penn State football, Pezzimenti was recruited by Sports Illustrated for Kids to write a feature story on Nittany Lions offensive lineman Stefen Wisniewski (November 2009 issue). As a young writer in Olean, Pezzimenti served as the primary beat reporter covering the St. Bonaventure men’s basketball team. In this role, he produced diverse, in-depth stories and commentary on a daily basis for print and web. Pezzimenti also wrote about the Buffalo Bills and high school sports, in addition to editing copy, designing pages and managing, mentoring and training interns. Pezzimenti graduated from St. Bonaventure University with a B.A. in Journalism/Mass Communications in 2004. While at St. Bonaventure, he was a student assistant for the men’s basketball team (2000-04) and worked as a part-time sports reporter for the Olean (N.Y.) Times Herald. Pezzimenti earned an M.S. in Education (Athletic Administration) from the State University of New York at Brockport in 2012. During his graduate studies, Pezzimenti was employed as an administrative assistant at William K. McLaughlin Associates, a nationally-known attorney staffing firm based in Rochester, N.Y. While with McLaughlin Associates, Pezzimenti advised and edited the content and layout of resumes and cover letters for job-seeking attorneys. A native of Allegany, N.Y., Pezzimenti attended Allegany-Limestone Central School, where he was a member of the National Honor Society and a varsity letterwinner in football and basketball. Self-proclaimed blogger, writer, editor, web manager and social media hotshot. Looking for Vinny’s super official resume? Download it right here.